I say scoliosis, you say...? Probably, nothing. I hadn't heard of it until I was diagnosed with it either. Several years on, I still remember catching a glimpse of my x-ray, not knowing it was mine, and being struck with horror at the image. That poor, poor person, I thought to myself. Hah, well, I was that poor, poor person. 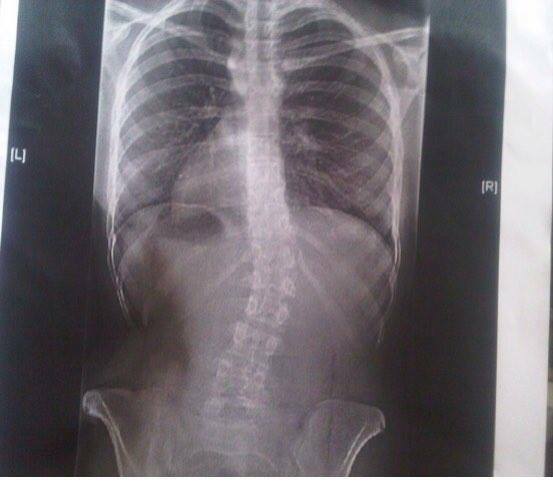 This was my spine, my x-ray, and my diagnosis. Most causes of scoliosis are unknown, but it can be caused by the spine not forming properly whilst you are a baby, or, in my case, trauma to the spine and its' muscles. When I was 13 I broke my pelvis and was in a wheelchair for a very long time. When I got out of my chair, my hip stuck out, something which we assumed was because of the trauma to my pelvis. It later turned out that my spine had curved, which could've been there since birth, as both my grandmother and great aunt suffer from it, but because my spine muscles were so strong, it never showed. Apparently, when I was a baby I used to sit up incredibly straight from as soon as I could sit unaided, and years of horse riding and being told to sit as straight as possible in the saddle meant I had incredibly strong core muscles - until I became wheelchair bound. The implications of scoliosis differ from person to person, some people develop chest problems if the curve is in the ribcage, or, in my case, can cause the hip to protude. Day to day, my back pain is managed and quite often I will go weeks without pain. Sadly, when I do get pain, I am left bed bound, dosed up on muscle relaxants and not entirely on this planet. Simple things can set off my scoliosis, like trying to clean the bath or sitting for too long, but I try not to let it get me down. When I was first diagnosed, I was entirely disgusted by how much my hip stuck out - it wasn't natural, I used to tell myself, and I used to spend hours looking at myself in the mirror trying to find a way to stand that 'hid' my hip. It wasn't until my spinal consultant twisted me in to an incredibly painful position to show me how to 'hide' my hip that I realised it was a lost cause trying to do this and that my body was definitely not flexible enough for that. But I am not downtrodden over this, people will always have it worse off than me. My pain, on the whole, is manageable thanks to a cocktail of muscle relaxants and painkillers, and I still have the use of my legs to exercise frequently to stop the pain. Scoliosis, if severe enough, can be treated through surgery which is advancing each and every day with fantastic results. Alternatively, physio and core exercise is offered as another option, something which I take full advantage of with physio accredited core DVD's and exercise sheets. To those who have been recently diagnosed and are looking for answers - it isn't a life sentence, and life really will go on.